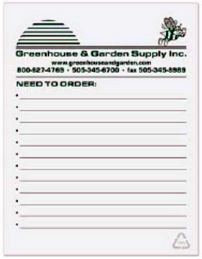 Custom Recycled Notepads -Scratchpads Personalized in Bulk. Promotional, Very Inexpensive. Budget Prices in America. Please check also our less expensive, regular (not recycled) wholesale custom imprinted scratchpads . Unit prices below include our 1-color custom imprint. There is a Setup Charge of $40.00. Add $0.10 per pad for each extra imprint color, plus another Setup Charge. Free artwork design and paper proof. RSP1-50 - 0.61 0.47 0.39 0.38 4-1/8"x5-3/8"
RSP4-50 1.58 1.03 0.84 0.62 0.57 5-3/8"x8-3/8"
Extra Imprint Colors: add $0.10 per pad. Magnets: add $0.20 per pad. RSP1-100 1.29 1.15 0.95 0.68 0.66 4-1/8"x5-3/8"
RSP4-100 2.05 1.84 1.51 1.12 1.03 5-3/8"x8-3/8"
- Paper Stock: 60 lb. white offset with 100% post consumer recycled content printed one standard color, one side. 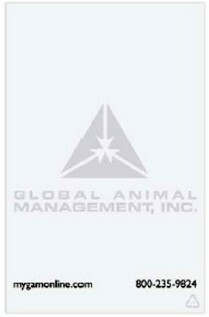 - Recycled symbol phantom printed same color in lower right corner of each sheet. - Padded 50 or 100 sheets to a pad with recycled chipboard back. - Standard Ink Colors: PMS® 185-Red, Reflex Blue, 348-Green, Pantone Yellow, 021-Orange, 202-Burgundy, Black. - Packaging: Bulk packed in cartons. - Production Time: 5-10 working days; contact us for faster delivery.